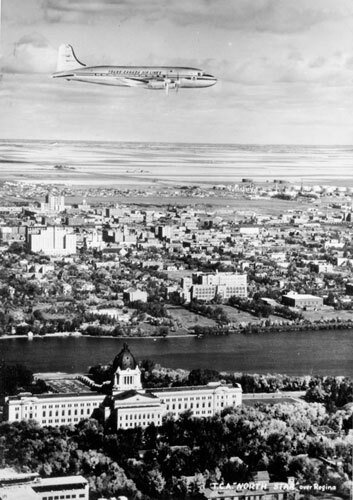 A Trans Canada Air Lines plane, the “North Star,” flies over Regina (1950s). National and international air transport developed in Canada immediately prior to the Great Depression. 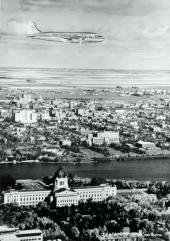 Western Canadian Airways, founded by Winnipeg financier James A. Richardson, launched airmail delivery flights across western Canada in 1930, with stops in Regina and Saskatoon. A decade earlier, aerial postal revenues had laid the foundation for development of a national commercial passenger airline system in the United States; the model failed in Canada, where railroads dominated Transportation, and the strategy was abandoned several years later. The federal government formed Trans-Canada Airlines (TCA), with mandated national and international routes, in 1937. Regina was situated on the mainline between Montreal and Vancouver when the Crown carrier began service with 12-passenger aircraft in 1939. Trans-Canada Airlines, later Air Canada, added Saskatoon, Yorkton, and Swift Current to its national route system in 1947. Saskatchewan air service was characterized by short-distance, low-density segments that prompted complaints from travelers: for example, a trip to Ottawa required three changes of aircraft. The introduction of larger, faster aircraft enabled the flag carrier to provide direct flights to major cities with connections to international destinations. In recent years, Air Canada has emerged as a full-service Flag carrier linking Saskatchewan to a world route network through a system of global code-sharing and fare alliances with other airlines. The jet age ushered in the concept of mass air travel in the mid-1960s. Wardair pioneered economical charter flights, but not without obstacles. In support of incumbent airlines, federal regulators established “Affinity Rules,” a protectionist measure which required passengers on a charter flight to be affiliated group members. Deregulation of the airline industry in the mid-1980s reduced barriers to entry, and encouraged competition and innovation in air travel. Tour operators were now able to hire aircraft and sell without restriction individual tickets on leisure charter flights from Regina and Saskatoon to a wide range of destinations. Air Canada, in the process, became a publicly listed company in 1989. Liberalized regulations allowed Canadian Airlines to attain national and international status through a series of acquisitions. Competition on domestic routes led to financial reversals that forced the integration of its operations with Air Canada, followed shortly by a merger of the two airlines. WestJet Airlines, a Calgary-based discount carrier, opened routes into Saskatchewan in 1996. The low-cost airline adopted new technology and an aggressive business model to challenge Air Canada, the dominant legacy airline, with expanded routes across the country and to the United States. Frontier Airline opened a trans-border route between its base in Denver, Colorado and Regina and Saskatoon in 1981. The same-plane service to major United States markets ceased several years later when the carrier filed for bankruptcy. Northwest Airlines arrived in Saskatchewan in 1995, supported by a hub airport system in Minneapolis, Minnesota, which efficiently distributes passengers to North American and international destinations. The direct link to a US gateway has proven to be of benefit to Saskatchewan's tourist trade and export economy.